Este ano o meu Natal foi muito diferente do que sempre tive. Como a minha mãe não estava cá eu fui com a minha Kika para casa da avó Maria. Ao início tive um pouco de receio pois não é comum ir para lá no Natal mas a Kika disse que ia ser muito divertido. E foi mesmo. Brinquei com toda a gente e ainda tive direito a um abraço do Pai Natal. This year my Christmas was very different from what I ever had. Because my mom is not here I went with my Kika to grandmother Maria's house. At first I was a little afraid because it's not common go there in Christmas but Kika told me that it was going to be very funny. And it was. I play with everybody and I still have a hug from Santa's himself. Tenho muitas saudades da minha mae e fiz este video para ela. 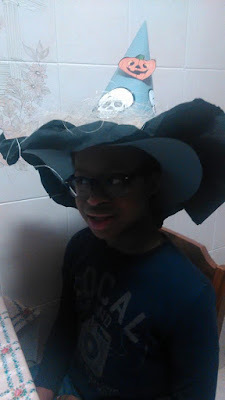 On Halloween, at school, there was this witch's hat contest. I tried my best... Mom always tells me I have to try my best and that my best will always be good enough (maybe she should learn with the things she tells me to keep me motivated). And guess what: my best was this really cool witch hat, that won the contest. 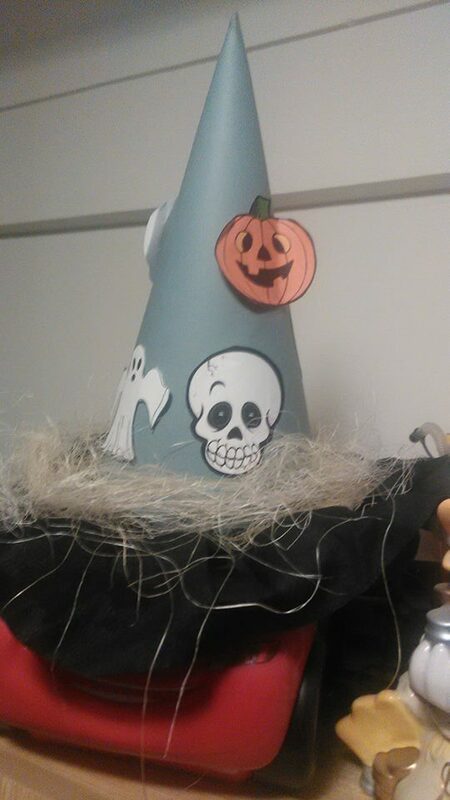 Mine was the best witch hat of all sixth graders. Este ano, na escola, houve um concurso de chapeus de bruxa. Foi o primeiro ano em que eu paricipei e nem sequer sei se houve concurso nos anos anteriores. 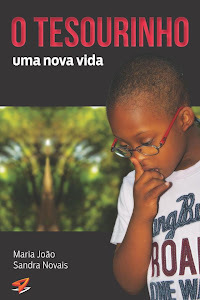 Eu dei o meu melhor... A minha mama diz-me sempre que eu tenho de dar o meu melhor e que o meu melhor sera sempre suficientemente bom (talvez ela deva aprender com as coisas que me diz para me manter motivado). 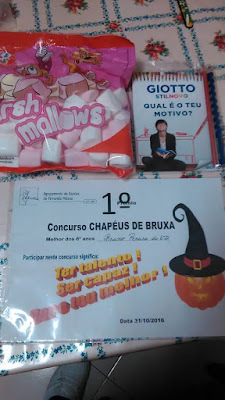 E adivinhem: o meu melhor foi este espetacular chapeu de bruxa, que ganhou o concurso. O meu foi o melhor chapeu de bruxa de todos os sextos anos. Being this far away from my son has a lot of down sides. Yes, he is the one with down syndrome and I am the one to be occasionally down. We see each other everyday over the internet and I get this huge sense of accomplishment and a great feeling of how I am raising him in the best possible way. I was so afraid that he would be too sad without me around him everyday. And the truth: he is learning to be independent from Mommy. So... doing a great job. My 13 year old boy is really growing up and will be a fine young man. One thing this last days showed me is that I am a lot stronger than I thought I would be... Life has funny ways to let you know you can't give up on your dreams and my life showed me it was time to move on. Today was a very important day for me. A step closer to my goals! Now I know I really am excellent (just the way I am). Soon... 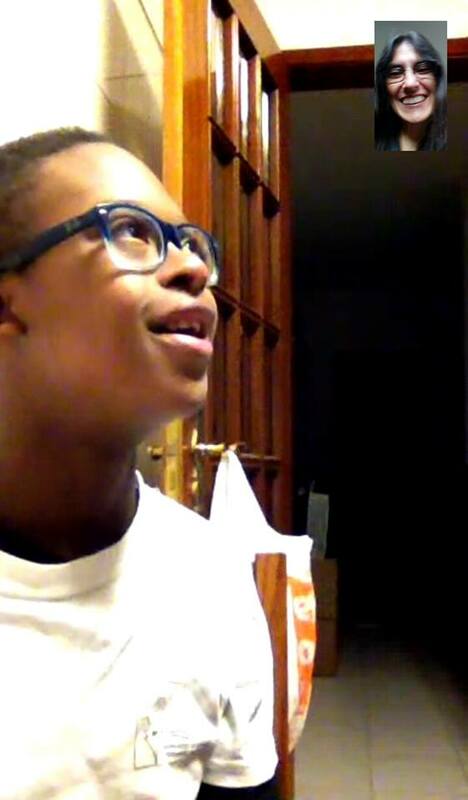 I will have my little chocolate man with me! 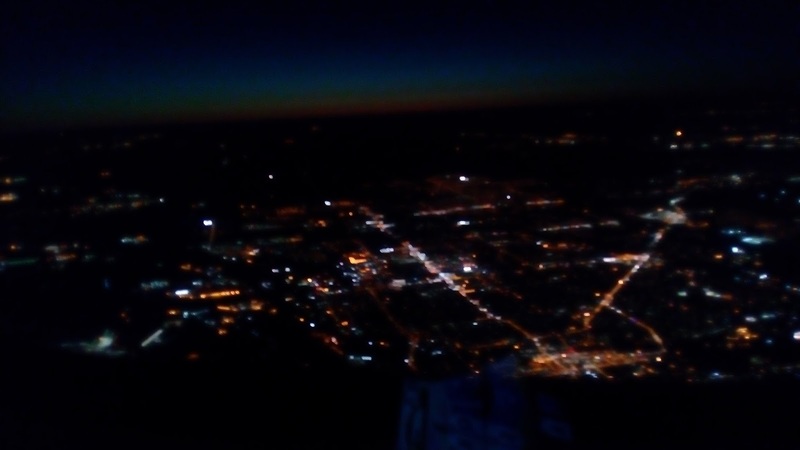 Today I was reading what I wrote on board of an airplane, on my way to my future. Decided to share what I wrote, because it also has to do with the future of this Little Treasure. Today, eve of my forty fifth birthday, I am on a plane, all alone, on the way the rest of my life. Is it frightening? Yes it is! But it is more frightening to let life go without really living. I owe that to myself and to my biggest treasure: my son! Because we deserve a lot more than just walk by this world. Because we deserve more than being another number in the crowd that just merely exists. Because we deserve to be happy! Because I was loosing courage. Because if I would go on waiting for the right moment maybe I wouldn't have the courage to do it. Because I needed to know I could do it. Because I had to escape the prison in witch I was closing myself. Because, above all I was only existing and was starting to stop living. We talked! Yes... She started talking to me and we talked for a while. We talked about Bruno (my favorite subject). We talked about what Portugal has to offer to children like Bruno and how things work in the United States. She asked why don't I became legal in the United States and bring Bruno here (as if it was an easy task... As if that wasn't what I want most at this point). One thing I am sure: my happiness and my son's only depend on me. It's only up to me to fight for a better future. Yes! I am also escaping from a family that has given me so many heartbreaks over the years and to whom I always lowered my head and never had the courage to stand up. A family that always made me feel that I was not good enough to "belong". Life is too short. And my life was stagnant, stuck in a sea of ​​despondency where I was leaving myself to drown. Another thing I am certain: I will give the best of me. I will be happy and help my son to be a very happy boy! I don't believe in regrets. In life there is a reason for everything. We will see... We will see what the future hods. Oddly enough, I haven't shed a tear yet. I said goodbye to my son at the airport and managed to contain the tears that stubbornly wanted to roll down my face. Then I had to take action and try to reach the boarding gate. Didn't have time to think a lot. Entered the plane... searched for my seat... took it... the urge to cry came back... and once again I still didn't allow the tears to roll down my cheeks. I do not want to allow myself to feel sorrow. I'm a fighter, and I will always fight for what is best for me and my chocolate candy."